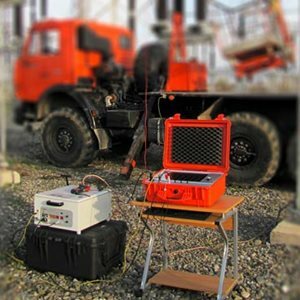 Used together with a reflectometer, the Overhead line testing system can show impedance irregularities in disconnected overhead lines of all voltage levels. These irregularities include short circuits, breaks and intermediate conditions. The system is mainly used for checking the overhead lines before they are switched back on, avoiding damage from travelling waves and potentially fatal problems. Regular checks should be performed, particularly to detect any changes in the line. The special design and switch-on system eliminate risks to the operator and damage to the equipment from induced voltages and currents.